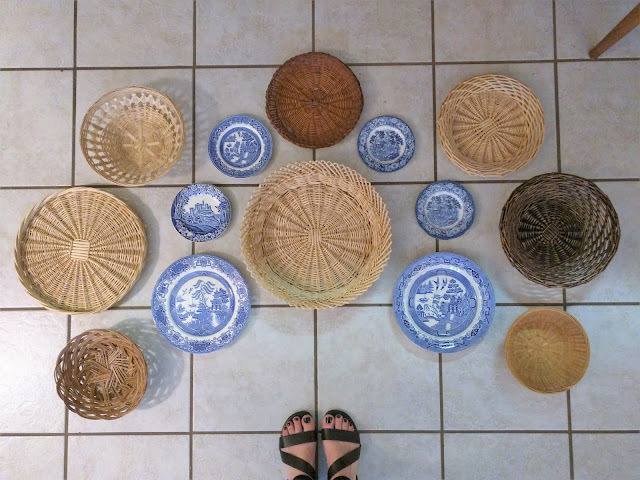 A few months ago I started picking up baskets of all shapes and sizes at my favorite thrift stores. I wasn't sure how I wanted to use them, but they eventually found a home atop the storage chest in our breakfast room. Today I'm sharing the details of how it came together. I showed you some of my inspiration pictures a few months ago. If you missed that post, you can catch up by clicking here. 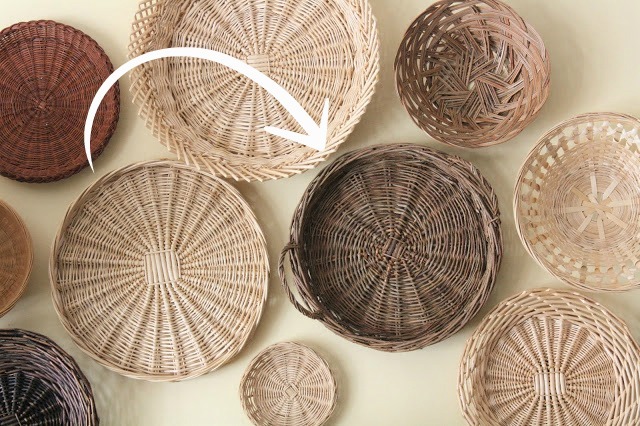 When I was looking for baskets that might work in a basket gallery wall, I tried to keep in mind they needed to be all different sizes and depths to pull off the look I was hoping for and to make the display interesting. Gathering them all was the easy and inexpensive part. I think I probably spent less than $20 on the entire wall. Most of the baskets came from the Salvation Army Thrift Store. Arranging them, now that was a different story. I laid them out in tons of different ways on the floor. I tried them with plates, too. As you can see here, I first thought symmetry was the way to go. But most of the rooms I had seen on Pinterest and in my Instagram feed had the baskets hung in somewhat random, off-center arrangements. Those are the ones that spoke to me. So, after agonizing over how to get started, I finally just hung one of the bigger ones high and to the left, and then I just kept adding them one at a time until they had my desired look. I used straight pins to hang them. No nail holes = happy husband. I have hints of red other places in the room, so that's what I used for the chest top. I gathered up all my red books and also added a bowl of fresh apples. I picked up the bowl at TJ Maxx. I thought it was unique looking and I loved the detailing in the leaves. Eventually I swapped out the apples for a plant. Every vignette needs greenery and this one was no exception. It feels less drab now. And I'll finish up with an evening shot - lamps on. On Instagram, when I posted a picture of the baskets, you guys said it was okay to mix these in with my fairly traditional decor. What do you think? Does it work? (My husband isn't crazy about it and he says he likes "almost everything" I do. Ha) Let me know below! You are too sweet! Thank you so much. The baskets are fantastic! What a great way to fill a large space with texture and different tones of color. I love the red books too.